A healthy alternative to your normal pancake breakfast. 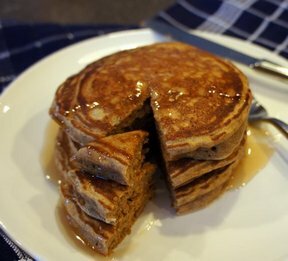 The cinnamon adds a little spice to these fluffy flap jacks. In a small bowl, mix flour, baking soda and Splenda. In a large bowl, mix milk, eggs and vanilla. Stir in dry mix roughly, so as to add more air to mix. Stir in cinnamon last. Spray griddle with cooking spray. Measure 1/3 cup batter onto skillet. Flip when batter bubbles. Serve with sugar free syrup and/or fruit! "My daughters are always looking for a healthy alternative and these were really good. 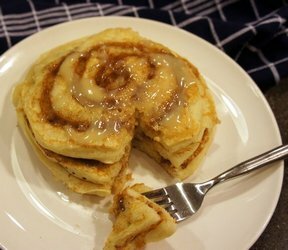 I liked the cinnamon in them and they were light and fluffy."